It would be difficult to overstate how much I loved this book. 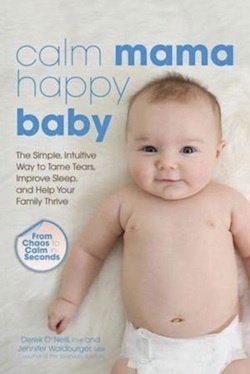 Calm Mama, Happy Baby: The Simple, Intuitive Way to Tame Tears, Improve Sleep, and Help Your Family Thrive by Derek O’Neill and Jennifer Waldburger is well-written and full of encouraging, useful, practical advice on how to transmit calm, reassuring energy to your baby. I fall into the generally-calm-mom-with-rough-moments category, and I absolutely find myself referring to the CALM technique during the tough times. Indeed, I’ve tried many of the techniques in the book, and although some may say they are common sense, reading about and practicing them has helped me to have a framework, meditations, or simply a sound (OM!) to fall back on when I feel my mind wandering from the calm place I want and need it to be. Moreover, visualization has been a big part of my life for several years, so the concept of the invisible umbilical cord especially resonated with me. I waited to write this review until a few weeks after I finished reading the book to see if its words would stick with me, and they have – every single day. I highly recommend this book for new parents especially but also for any parents who want to feel a closer connection with their children. Awesome, awesome book.